Football Form Labs was launched in October 2010 and is one of the leading providers of analysis software in the football betting markets. We are based in South West London where we have developed our football betting software from the ground up. Our software is the perfect tool for all levels of bettors and football fans from those who want to bet pre-match at a low level or are purely interested in match statistics through to those who are trading and betting large volumes as we combine vast databases with innovative features within a clear and easy to use framework. Football Form Labs, and its sister operation, Bettorlogic, was formed 10 years ago to answer the growing demand of bettors who wished to access reliable and up to date information that would assist them with their betting decisions. Initially, our analysts would interrogate the database in the quest to find the most meaningful data when it comes to evaluating a football match. That hands on approach formed the basis for developing the software that now resides in the Form Lab products. We are bettors and like to think that we understand what bettors need to make a profit from their investments. Form Lab Max – our pre-match software package which allows users to analyse any football match from 50 different leagues and also comes with our own analysts daily recommendations and strategy research (both also part of Form Lab Black). Form Lab Black – our premium package which gives you the complete tools to fully analyse any football match from 50 leagues around the world. Right the way through from analysing team news with our player analysis tool, to pre-match analysis and then in-play with our analysis functions and Livelogic. Form Lab Black is the ultimate tool for anyone looking to make money from betting and trading on football. Andrew Dagnall, CEO - Founder and CEO of Football Form Labs and Bettorlogic with a history of betting stretching back nearly 40 years. The one that got away – a 660/1 double on Royal Gait to win the Champion Hurdle and Marwell the 1,000 guineas at 10’s, only for the later to be denied in the stewards room. Keen golfer and active footballer until injury forced retirement, much to the relief of his teammates. Will Wilde, Head Trader - Will has an interest in playing, watching and betting on every sport imaginable. An expert in in-play trading and identifying pre-match value. When he’s not tweeting away furiously, Will can be found writing about himself in the third person. Alex Coldicott, Head Analyst - Alex joined Football Form Labs after completing a Masters in Maths and Statistics from the University of Bristol. Alex is a keen follower of most sports but in particular football, tennis and cycling. He’s also a former US and Canadian Amateur Rackets Champion. create the most complete football analysis tool available. 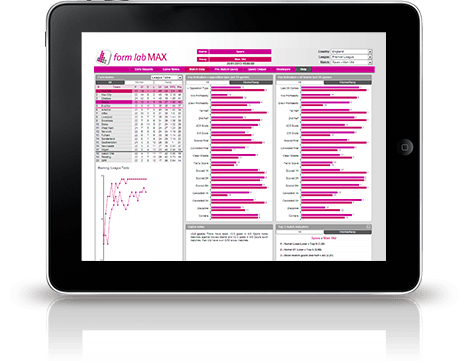 Form Lab Black provides all the detailed pre-match analysis functions of Form Lab Max along with multiple in-play instruments and player analysis options. For the serious bettor or trader this makes Form Lab Black the ultimate package.